Collapsible Wire Containers Set Up in Seconds and Fold Flat to Save Space and Reduce Return Shipping Costs. Open wire mesh provides excellent visibility for easy inventory control. Wire storage containers help eliminate dust and dirt build up. Notched, positive stacking legs permit handling by forklift or pallet truck. Drop gate allows access when stacked. 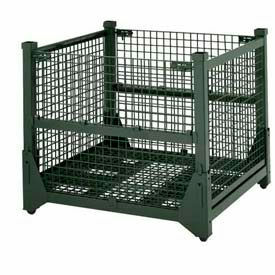 These one piece Heavy-Duty folding containers feature wire mesh arc-welded to a channel formed steel base. The sides and corners of these shipping containers are heavily reinforced for toughest industrial uses. Durable gray powder coat finish resists rust and corrosion. Wire bulk containers stack up to 4 high. Add optional features to meet your needs. Blue Nylon Covers keep contents hidden, secure, and dust free. Made with water resistant 400 denier nylon. Reinforced corners and double stitching for added durability. Features flip front door panel with touch closure and self adhesive attachment section to fasten cover to cart. Caster Kit for mobilization. 4 swivel, 2 braking, 5"x 1-1/2" mold-on rubber casters. 1,400 lb capacity. 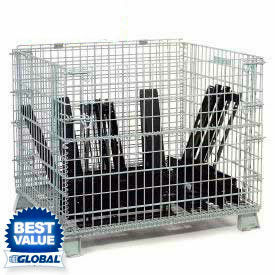 Optional Wire Mesh Hinged Lid is padlockable for security. Hinged to allow easy access to contents. 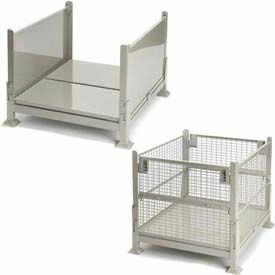 Standard Duty containers with zinc-plated finish feature steel base to add strength. Combine strength with minimum weight. Available in container and container with lid. Optional caster kit for mobilization. Folding Steel Containers - Sheet Metal and Wire Mesh - Are Used For Industrial And Commerical Storage Needs. Folding Steel Containers are made of steel with a zinc galvanized finish for long lasting durability. Floor is Sheet Metal on Tubing Base Structure to provide easy set up. Folds flat to save space and shipping costs. Containers measure 40-1/2" x 34-1/2" x 26" upright height and 11-1/2" collapsed Height. Load Capacity is 3200 lbs. Maximum stack height is 5 Containers. Stack Height is 4 High for truck shipments. Stack Height of 9 when collapsed for return shipping. Inside Usable Volume is 14 or 18 Cubic Feet 4 Inter-Stackable with other containers. Plastic Folding Bulk Containers Store And Transport Various Items Safely And Securely. Plastic Folding Bulk Containers are made of high-density polyethylene plastic for long lasting durability. Features a folding design for easy storage and portability. 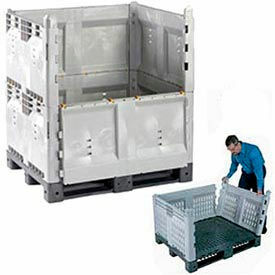 Bulk containers offer a four-way fork entry for greater control while handling. Plastic folding bulk containers can be stacked without racking for greater stability and safety. Structural-foam molded construction offers enhanced strength and support. Bins, totes and containers are easy to clean. Colors are Black, Blue or Gray. Dimensions and weight capacities vary per model. Bulk Container Lids are sold separately. Protects contents against damage from dust and debris for added reliability. 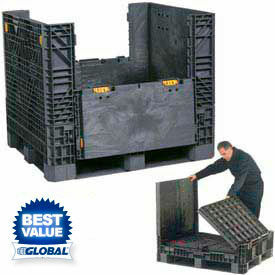 Quick Assembly Pallet Containers Save on Return Shipping Costs! 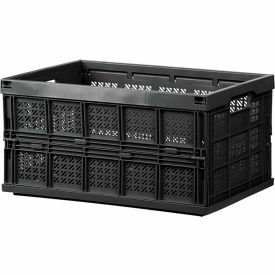 These plastic pallet containers are used for agricultural, pharmaceutical, industrial and food service environments. These USDA approved, high density structural foam polyethylene bulk plastic containers resist rust, chemicals, rotting and warping. Large plastic storage containers withstand temperatures from 0°-140°F. Interlocking sides disassemble in seconds with a quick-release safety latch and lock back together securely without special tools, saving up to 75% of space on return shipping. Bulk storage containers stack up to 6 high with patented interlocking corners. Base permits 4-way fork entry and can be used as pallets without sides. Gray color. Available Solid Wall or Vented Wall containers. Caster Models have 6" plate casters (2 swivel, 2 rigid) with reinforced dolly base that allows stacking. Folding Shipping Containers Are Collapsible and Stackable, Save Space And Shipping Costs. These folding containers provide up to a 5:1 reduction ratio in shipping volume when containers are empty and folded. Sturdy gray plastic containers include comfort grip ergonomic handles and a large label area with cardholder. Gray Solid Wall Containers are designed to fit on a standard 48" x 45" pallet footprint. Black Mesh Containers are light weighted containers for assembly area, car trucks. Allows secure stacking when folded and when in use. 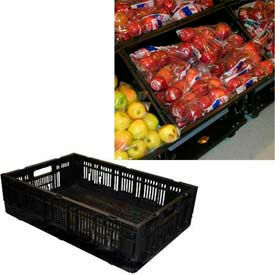 Collapsible Lugs Are Used For Display And Transportation Of Grocery Produce. Collapsible Lugs are made with ABS plastic for long lasting durability. Features a lightweight and collapsible design for easy storage and portability. Bins nest 1 inch and are stackable for ease of use. Offers a convenient lip for toting. Smooth and rounded edges for added safety. Color is Black. 23-1/2 inch Length x 15-1/2 inch Width. Height is 4-1/2 or 6-1/2 inches. Package quantity is 1. 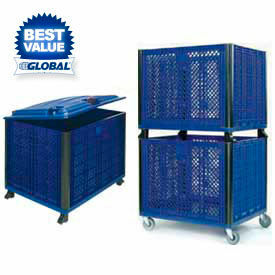 Hold 'N Fold® Collapsible Containers Save Valuable Floor Space In Warehouses Or Industrial Work Areas. Hold 'N Fold® Collapsible Containers are made of wire mesh or corrugated metal for long lasting durability. The tubular construction increases container rigidity and strength. Containers provide space savings by storing or staging ready for use items on production floor. Sides lift into position and automatically lock in place. Used for inter or intra-plant shipments and to save shipping costs returning empty containers. Hold 'n Fold self-locks when folded, eliminating the need for banding. Half drop gates on both sides provide easy access to contents. 4,000 lb. capacity standard. Patented. Stackable up to six high. Optional drop gates simplifies loading and unloading. Measures 48"L x 45"W x 42"H.